For other uses, see Sand (disambiguation). The composition of sand varies, depending on the local rock sources and conditions, but the most common constituent of sand in inland continental settings and non-tropical coastal settings is silica (silicon dioxide, or SiO2), usually in the form of quartz. The second most common type of sand is calcium carbonate, for example, aragonite, which has mostly been created, over the past half billion years, by various forms of life, like coral and shellfish. For example, it is the primary form of sand apparent in areas where reefs have dominated the ecosystem for millions of years like the Caribbean. Sand is a non-renewable resource over human timescales, and sand suitable for making concrete is in high demand. Desert sand, although plentiful, is not suitable for concrete, and 50 billion tons of beach sand and fossil sand is needed each year for construction. The exact definition of sand varies. The scientific Unified Soil Classification System used in engineering and geology corresponds to US Standard Sieves, and defines sand as particles with a diameter of between 0.074 and 4.75 millimeters. 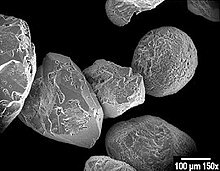 By another definition, in terms of particle size as used by geologists, sand particles range in diameter from 0.0625 mm (or ​1⁄16 mm) to 2 mm. An individual particle in this range size is termed a sand grain. Sand grains are between gravel (with particles ranging from 2 mm up to 64 mm by the latter system, and from 4.75 mm up to 75 mm in the former) and silt (particles smaller than 0.0625 mm down to 0.004 mm). The size specification between sand and gravel has remained constant for more than a century, but particle diameters as small as 0.02 mm were considered sand under the Albert Atterberg standard in use during the early 20th century. The grains of sand in Archimedes Sand Reckoner written around 240 BCE, were 0.02 mm in diameter. A 1953 engineering standard published by the American Association of State Highway and Transportation Officials set the minimum sand size at 0.074 mm. A 1938 specification of the United States Department of Agriculture was 0.05 mm. Sand feels gritty when rubbed between the fingers. Silt, by comparison, feels like flour). ISO 14688 grades sands as fine, medium, and coarse with ranges 0.063 mm to 0.2 mm to 0.63 mm to 2.0 mm. In the United States, sand is commonly divided into five sub-categories based on size: very fine sand (​1⁄16 – ​1⁄8 mm diameter), fine sand (​1⁄8 mm – ​1⁄4 mm), medium sand (​1⁄4 mm – ​1⁄2 mm), coarse sand (​1⁄2 mm – 1 mm), and very coarse sand (1 mm – 2 mm). These sizes are based on the Krumbein phi scale, where size in Φ = -log2D; D being the particle size in mm. On this scale, for sand the value of Φ varies from −1 to +4, with the divisions between sub-categories at whole numbers. The composition of mineral sand is highly variable, depending on the local rock sources and conditions. The bright white sands found in tropical and subtropical coastal settings are eroded limestone and may contain coral and shell fragments in addition to other organic or organically derived fragmental material, suggesting sand formation depends on living organisms, too. The gypsum sand dunes of the White Sands National Monument in New Mexico are famous for their bright, white color. Arkose is a sand or sandstone with considerable feldspar content, derived from weathering and erosion of a (usually nearby) granitic rock outcrop. Some sands contain magnetite, chlorite, glauconite or gypsum. Sands rich in magnetite are dark to black in color, as are sands derived from volcanic basalts and obsidian. Chlorite-glauconite bearing sands are typically green in color, as are sands derived from basaltic lava with a high olivine content. Many sands, especially those found extensively in Southern Europe, have iron impurities within the quartz crystals of the sand, giving a deep yellow color. Sand deposits in some areas contain garnets and other resistant minerals, including some small gemstones. Rocks erode/weather over a long period of time, mainly by water and wind, and their sediments are transported downstream. These sediments continue to break apart into smaller pieces until they become fine grains of sand. 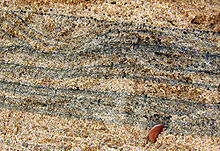 The type of rock the sediment originated from and the intensity of the environment gives different compositions of sand. The most common rock to form sand is Granite, where the Feldspar minerals dissolve faster than the Quartz, causing the rock to break apart into small pieces. In high energy environments rocks break apart much faster than in more calm settings. For example, Granite rocks this means more Feldspar minerals in the sand because it wouldn't have had time to dissolve. The term for sand formed by weathering is epiclastic. Sand dunes are a consequence of dry conditions or wind deposition. The Sahara Desert is very dry because of its geographic location and is known for its vast sand dunes. They exist here because very little vegetation is able to grow and there's not a lot of water. Over time, wind blows away all the fine particles, such as clay and dead organic matter, leaving only sand and larger rocks. Only 15% of the Sahara is sand dunes, while 70% is bare rock. The wind is responsible for creating these different environments and shaping the sand to be round and smooth. These properties make desert sand unusable for construction. Beach sand is also formed by erosion. Over thousands of years, rocks are eroded near the shoreline from the constant motion of waves and the sediments build up. Weathering and river deposition also accelerate the process of creating a beach, along with marine animals interacting with rocks, such as eating the algae off of them. Once there is a sufficient amount of sand, the beach acts as a barrier to keep the land from eroding any further. This sand is ideal for construction as it's angular and of various sizes. Marine sand (or ocean sand) comes from sediments transported into the ocean and the erosion of ocean rocks. The thickness of the sand layer varies, however it's common to have more sand closer to land. This type of sand is ideal for construction and is a very valuable commodity. Europe is the main miners of marine sand, which greatly hurts ecosystems and local fisheries. 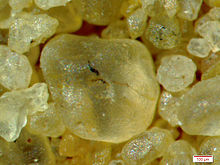 Pitted sand grains from the Western Desert, Egypt. Pitting is a consequence of wind transportation. Sand grains of yellow building sand. Microscope Lumam P-8. EPI lighting. The photo of each grain of sand is the result of multifocal stacking.. Artificial islands in the Persian Gulf. Glass: Sand rich in silica is the principal component in common glasses. Hydraulic fracturing: A drilling technique for natural gas, which uses rounded silica sand as a "proppant", a material to hold open cracks that are caused by the hydraulic fracturing process. Recreation: Playing with sand is a favorite beach time activity. One of the most beloved uses of sand is to make sometimes intricate, sometimes simple structures known as sand castles. Such structures are well known for their impermanence. Sand is also used in children's play. Special play areas enclosing a significant area of sand, known as sandboxes, are common on many public playgrounds, and even at some single family homes. Sand dunes are also popular among climbers, motorcyclists and beach buggy drivers. Zoanthid "skeletons": Animals in this order of marine benthic cnidarians related to corals and sea anemones, incorporate sand into their mesoglea for structural strength, which they need because they lack a true skeleton. Only some sands are suitable for the construction industry, for example for making concrete. Because of the growth of population and of cities and the consequent construction activity there is a huge demand for these special kinds of sand, and natural sources are running low. In 2012 French director Denis Delestrac made a documentary called "Sand Wars" about the impact of the lack of construction sand. It shows the ecological and economic effects of both legal and illegal trade in construction sand. To retrieve the sand, the method of hydraulic dredging is used. This works by pumping the top few meters of sand out of the water and filling it into a boat, which is then transported back to land for processing. Unfortunately, all marine life mixed in with the extracted sand is killed and the ecosystem can continue to suffer for years after the mining is complete. Not only does this affect marine life, but also the local fishing industries because of the loss of life, and communities living close to the water's edge. When sand is taken out of the water it increases the risk of landslides, which can lead to loss of agricultural land and/or damage to dwellings. Sand's many uses require a significant dredging industry, raising environmental concerns over fish depletion, landslides, and flooding. Countries such as China, Indonesia, Malaysia and Cambodia ban sand exports, citing these issues as a major factor. It is estimated that the annual consumption of sand and gravel is 40 billion tons and sand is a US$70 billion global industry. The global demand for sand in 2017 was 9.55 billion tons as part of a $99.5 billion industry. While sand is generally non-toxic, sand-using activities such as sandblasting require precautions. Bags of silica sand used for sandblasting now carry labels warning the user to wear respiratory protection to avoid breathing the resulting fine silica dust. Safety data sheets for silica sand state that "excessive inhalation of crystalline silica is a serious health concern". In areas of high pore water pressure, sand and salt water can form quicksand, which is a colloid hydrogel that behaves like a liquid. Quicksand produces a considerable barrier to escape for creatures caught within, who often die from exposure (not from submersion) as a result. In Dubai, United Arab Emirates, the use of sand has been very demanding in the construction of infrastructure and creating new islands. They completely ran out of their own reserves and now import most of their sand from Australia. There have been three projects to create artificial islands needing more than 835 million tonnes of sand, which costed more than $26 billion USD. ^ Glossary of terms in soil science (PDF). Ottawa: Agriculture Canada. 1976. p. 35. ISBN 978-0662015338. ^ Constable, Harriet (3 September 2017). "How the demand for sand is killing rivers". BBC News Magazine. Retrieved 9 September 2017. ^ Albarazi, Hannah. "The Slippery Slopes of the World Sand Shortage". Retrieved 29 March 2019. ^ Seaweed also plays a role in the formation of sand. Susanscott.net (1 March 2002). Retrieved on 24 November 2011. ^ Gilman, Larry (2014). Sand. 7 (5 ed.). The Gale Encyclopedia of Science. pp. 3823–3824. ^ a b Padmalal, Maya (2014). "Sources of Sand and Conservation". Sand Mining. Springer, Dordrecht. pp. 155–160. ISBN 978-94-017-9143-4. ^ "Sahara". THE COLUMBIA ENCYCLOPEDIA (6 ed.). COLUMBIA UNIVERSITY PRESS. 2000. ISBN 9780787650155. ^ "What is the reason for not using sea and desert sand for construction?". The Hindu. 2 August 2015. ISSN 0971-751X. Retrieved 9 April 2019. ^ "How Is A Beach Formed?". WorldAtlas. Retrieved 10 April 2019. ^ "Psammophile". Merriam-Webster.com. Retrieved 27 January 2016. ^ "Importing Sand, Glass May Help Restore Beaches". NPR.org. 17 July 2007. ^ Yong, Syed E. Hasan, Benedetto De Vivo, Bernhard Grasemann, Kurt Stüwe, Jan Lastovicka, Syed M. Hasan, Chen (5 December 2011). ENVIRONMENTAL AND ENGINEERING GEOLOGY -Volume III. EOLSS Publications. ISBN 9781848263574. ^ See Sand Wars teaser here. ^ Simon Ings (26 April 2014). "The story of climate change gets star treatment". New Scientist: 28–9. ^ Torres, Aurora; et al. (8 September 2017). "The world is facing a global sand crisis". The Conversation. Retrieved 9 September 2017. ^ "The hourglass effect". The Economist. 8 October 2009. Retrieved 14 October 2009. ^ Beiser, Vince (26 March 2015). "The Deadly Global War for Sand". Wired. Retrieved 26 March 2015. ^ Doyle, Alister (11 February 2019). "As ice melts, Greenland could become big sand exporter: study". www.reuters.com. Retrieved 12 February 2019. ^ Silica sand MSDS Archived 11 March 2006 at the Wayback Machine. Simplot (13 March 2011). Retrieved on 24 November 2011. ^ Pilegis, M.; Gardner, D.; Lark, R. (2016). "An Investigation into the Use of Manufactured Sand as a 100% Replacement for Fine Aggregate in Concrete". Materials. 9 (6): 440. doi:10.3390/ma9060440. PMC 5456819. PMID 28773560. ^ PEDUZZI, Pascal (April 2014). "Sand, rarer than one thinks". Environmental Development. 11: 208–218. Look up sand in Wiktionary, the free dictionary. Beach, Chandler B., ed. (1914). "Sand" . The New Student's Reference Work . Chicago: F. E. Compton and Co.